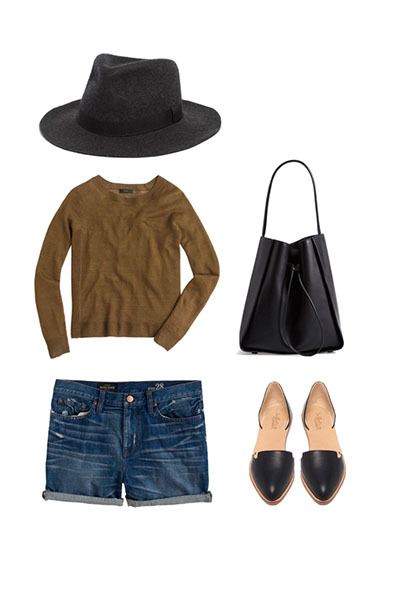 Pack For Summer in NYC - Hej Doll | Simple modern living by Jessica Doll. It’s been awhile since my last trip to NYC, and I’m dying to go back. The summers are usually hot, and sometimes (ok, usually) humid. The sweater is light and perfect to layer on a plane, while the other items leave plenty of options for outfit changes and such. If you want to lighten your load even more, I’d remove the one of the skirts and striped tee. If you don’t plan to go anywhere nice, leave the heels at home. I think my favorite piece from this list is the sunglasses, they are so quirky and different. You can shop the links above and see outfits below. What would you pack for Summer in NYC? THAT bucket bag. I need. You created some amazing packing ideas/outfit ideas! Love them all! I’m lusting after it so hard right now. Right after the sunnies. I have a thing for weird sunglasses, haha. OBSESSED with everything you put together! They are amazing looks! Love those black loafers!! I always try to pack in neutral colors for trips so that my outfits can go further. Great ideas! Amazing outfits. I love how they can be mixed and matched. This is something I need to work on when I’m packing. I feel like I throw everything in my suitcase without giving much thought to being able to mix it up. I love the denim skirt with the Nikes!!! Such great tips!! Wish I had seen this before I spent the summer there last year!! These are such awesome tips! A bunch of my friends went to NYC a few weeks ago, and I think all of this info would have really helped them – they kept texting me telling me how they were melting in the NYC heat! Wow, I LOVE all these sets! I would wear every single one. Can you believe I’ve never been to NYC? I NEED a trip there soon! Love all of your outfit choices!! If I’m in the city, I def would bring comfy shoes and that probably all that would be on my “must bring” list. now, NYC in the winter is a whole different story! How awesome! I’m heading to NYC soon, and I know it won’t be nearly as hot as Texas lol. This is a great list to help me prepare! Eeeeek I love this! So perfect for me especially since I just moved to NYC 🙂 Sneakers are seriously a must! How perfect I came across this post on Pinteret. I’m traveling to NY next week and was looking at the weather on how I should dress during my stay. Thanks so much for sharing! This was helpful. Heading to NYC for a weekend in May then on to Greece not sure as to what to pack. Any suggestions?